We love getting updates from adopters of our Wags and Walks alumni! Especially after we follow up congratulating them on their adoptiversary! Helen sent us an update telling us Frankie/Fabby, now known as Moose, “Is the light of our life” and we couldn’t be more overjoyed to hear so! And then came the best part! Helen and her partner would like to start fostering for Wags and Walks! We love when our alumni community wants to get further involved. Do you live in the Los Angeles area? If so, learn how you can get involved here! We recently got a very exciting pupdate about this gorgeous pup who is challenged in the hearing department. 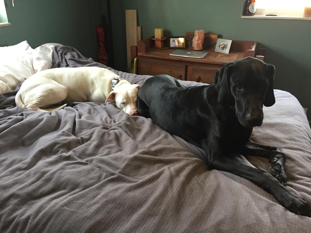 Despite a few initial struggles, he has comfortably adapted to his new home with his buddy Ollie. During the chilly months, Otis loves to get under the covers and snuggle with Ollie and his forever dad, Bob. Since Otis is unable to hear the world around him he is not shy about the fact that he needs a clear view of the world around him.... sometimes to the detriment of the window curtains. In addition to Otis’ redecorating abilities, he has a strong work ethic. He regularly assists his dad at work and only occasionally falls asleep in meetings (What? everybody’s doing it!) But despite the occasional nap, Otis does make a difference in the office. His presence in the office has been helping a young Labrador in the office become better mannered. When Otis isn’t able to come to the office, he waits patiently for his dad to come home from work and greets him from afar without any pesky curtains blocking his view. There is no doubt Otis feels loved and cared for in his forever home. We are so happy that he is doing so well!